If you want to quickly access something from the Mac Dock within the Finder, many users will right-click on the Dock icon and go to Options to choose “Show in Finder”. There’s nothing wrong with that approach and it works quite well, but there’s a faster way possible with a Command click. 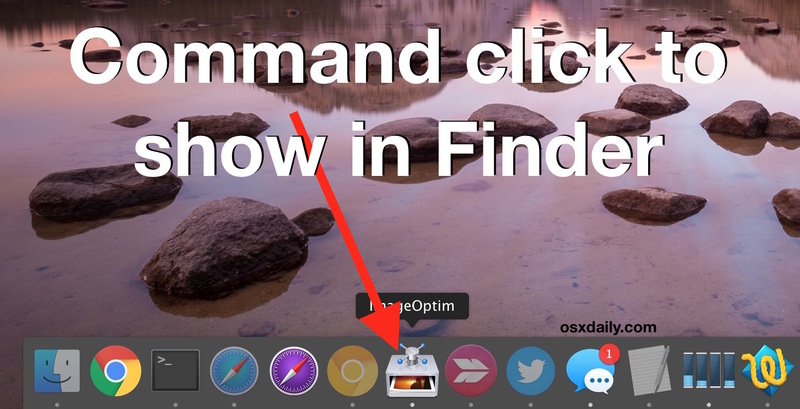 This is a really simple trick, and it works with anything in the Dock, whether it’s an app, a minimized window, a hidden app, or anything else in the Finder of Mac OS X. All there is to it is holding down the Command key while you click on any Dock item, it will instantly open the containing folder within the file system of the Mac. This trick also works to show items in Finder from the Dock that are contained within Dock Stacks, and it doesn’t matter if the item is an app or a file or a folder, whether it’s on the left side or right side of the Dock, it will go to it’s original Finder location. Try this one out the next time you need to access something from the Finder, it works great. Man, there must be millions of keyboard shortcuts for OS X. Every time I think I finally have a handle on them, someone comes out and adds another to the list. This one is a great one. I am constantly right-clicking and “Show in Finder”ing. This beats that hands down! yes indeed, I did the same thing as Dave M. until now great shortcut. Well I’ll be darned. Another obscure shortcut slips out. Good tip!